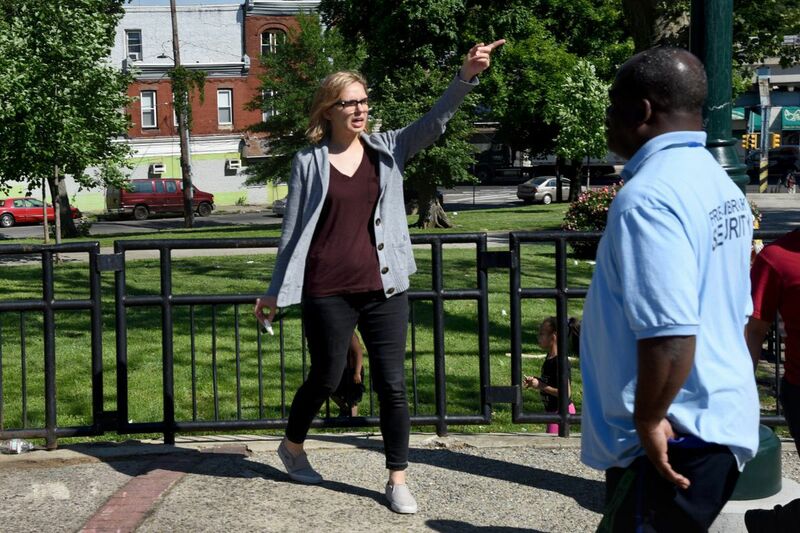 Librarian Chera Kowalski, 33, is an active member of the Kensington community. The overcast sky and occasional rain on May 20 couldn't dampen the community spirit at the annual Spring Fest at McPherson Park. This year was a particularly special event, because, in addition to the food, music and games, neighbors celebrated the 100th birthday of the library and recognized the contributions of park champion Awilda Ocasio. Before she died in April, Awilda was the Community Engagement Coordinator at Impact Services Corporation and a tireless champion of Kensington and its residents. Awilda would have loved the Inquirer articles touting the amazing work the librarians at McPherson do every day, but she would have been crushed to see the park described as Needle Park and the neighborhood called a "hellscape." Calling it Needle Park perpetuates a story about Kensington that reduces everyone here to victims or criminals, further instilling a sense of hopelessness. Awilda worked hard to change the narrative of Kensington so that people would recognize the vibrancy of her neighborhood and the strong spirit of its residents. Her work was part of a collaborative strategy to build collective strength and support a robust social network throughout the community. Impact Services is working with several partners, including the New Kensington Community Development Corporation, Philadelphia LISC and the Scattergood Foundation to create a community engagement strategy that recognizes the histories of individual and community-wide trauma, yet focuses on creating environmental safety, building social connections, identifying neighborhood leadership and bringing together resources to create new opportunities for residents. Referred to as "trauma-informed" community development, this strategy takes a page from the behavioral health field by acknowledging the physical and mental toll that comes from living in a neighborhood that suffers from decades of disinvestment, neglect, poverty and the narcotics trade, but doesn't view those experiences as the defining characteristics for the community or its residents. This approach requires a paradigm shift that broadens the lens to focus on community action fostering resiliency and healing. A trauma-informed model empowers individuals by recognizing that they are the experts on their own lives and experiences. At the community level, this means ensuring residents are partners in planning and execution, thus elevating their importance as stakeholders and our accountability to the community. Many residents are justifiably suspicious of those who promise change and are wary of getting their hopes up, yet again. This change in lens brings into focus the partnerships in the neighborhood that are already creating safe play space for children on their blocks, cleaning the empty lots and replacing trash with grass, bringing art and investment, expanding the Philly Police Department "SafeCam" program, creating loans for local businesses and offering the human capital to clean the park and support the library. One of the speakers on May 20 told the crowd, "This is our park and when people call it 'Needle Park' we must say 'NO! This is our park. This is McPherson Park.'" We appreciate that the media are shining light on the challenges people face in Kensington. Chera, Miss Judy, Marion and all of their coworkers at the library deserve the highest praise for creating a safe place for kids to play and learn in the face of serious, often deadly, problems. But when that praise comes tied to a description of the neighborhood that flattens everything else to a "hellscape," it obscures the larger picture, one that includes Kensington's hard-won progress, innovative approaches and momentum toward positive change. Casey O'Donnell is president and CEO of Impact Services Corp.; Felix Torres-Colon is executive director, New Kensington CDC; and Joe Pyle is president & CEO, Thomas Scattergood Behavioral Health Foundation.